I have very fond memories of SM City North EDSA. When it newly opened in 1985, our family visited the new mall and even back then, we were already fascinated at how big the mall was. I was still a kid then and we loved going to the amusement center where we would play, win and collect tickets which I even have till this very day. I remember catching glimpses of celebrities, both local and foreign, who would visit the mall to perform and hold autograph sessions at the SM Entertainment Plaza. I was even able to catch a live episode of Family Kwarta o Kahon hosted by Pepe Pimentel when it used to tape there. And snacking at the food court and rest was a must after all the excitement afterwards. 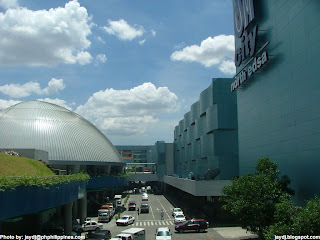 When I was in college, my classmates and I would go to SM City North EDSA to watch a movie during our breaktime. I even remember that we watched two movies straight at the SM Cinemas when we learned that we had a 6 hour break in between classes for that day. When I graduated from Ateneo, my very first job was a musical arranger and I had to collaborate with my co-arranger who lived in Valenzuela. We would regularly meet over merienda at Wendy's at the SM Annex to talk about our next song. And after a heavy brainstorming session, we'd relax by playing some rounds of bowling at the SM Bowling Center. When I needed to buy computer parts, I'd go to Cyberzone which used to be located where the carpark is. I bought my very first hi-tech mobile phone there too. I guess in a way, I grew up with the City as it evolved during the years. And now that SM City North EDSA introduces The Sky Garden, the newest addition to its ever-growing city, I couldn't let the opportunity slip to learn and experience this new addition. After all, it's because of this newest addition that SM City North EDSA is now the largest mall in the Philippines. The entire Sky Garden is an elevated structure connecting SM's The Block, the City Center and The Annex as well as the overpasses crossing EDSA and North Ave. Living up to its name, the Sky Garden is beautifully landscaped with trimmed grass, green tress and groomed bushes. I later learned that the Roof Garden has fifty five botanical species which grow on lightweight garden soil. I couldn't help but notice that simply strolling around the Sky Garden leaves very few traces that you're actually beside a very busy highway. It actually takes you away from the busy metropolis and gives you a feeling of serenity without having to go far away. In addition to the tranquil green scenery, there are various ponds and fountains spaciously spreaded out at the Sky Garden. 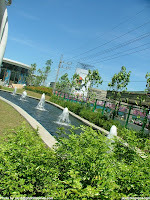 There's the calm and soothing pond surrounding the soon-to-open Starbucks Coffee, multiple mini fountains parallel to the walkways, and the most spectacular waterfall leading from the Sky Garden to the ground level. 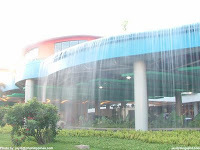 The waterfall is a 2-storey drop from the Sky Garden to another pond at the base near the bus terminal. 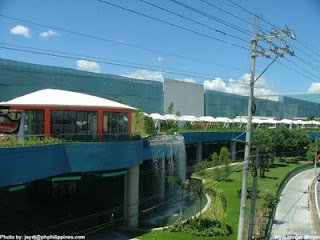 Who would've known that EDSA would gain such a scenic waterfall courtesy of the Sky Garden ? Cafes, grills and eateries are conveniently positioned along the walkways. You could snack, dine, or simply have a cup of coffee at the Sky Garden. And even if the mall closes, you can hang out at the Sky Garden because they offer patrons extended hours. 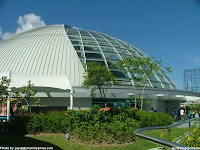 At the heart and center of the Sky Garden is the Sky Dome. This is the newest venue for events which can accommodate more than a thousand people. Half of the dome-shaped top is transparent. You may even be able to see the moon and the stars on a bright night even from inside the Sky Dome. 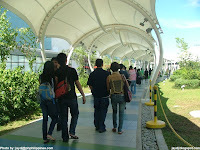 The main artery of the Sky Garden are the well lit and covered walkways leading to different parts of the Garden as well as to and from the malls. I was also impressed by the sound system for the entire Sky Garden as state-of-the-art Boss branded speakers are placed in each section of the covered walk's stretch. Whether playing relaxing music or a making a public service announcement, everybody within the Sky Garden will surely hear it. Another thing I noticed is that the entire Sky Garden is curved. From the covered winding walkways, to posts and establishments within the Sky Garden including the Sky Dome, everything is curved. It breaks out from our notion of malls being square or rectangular buildings with stores in them. most of the artistic structures also follow that fashion. It's another reason for its uniqueness. Take a stroll with your loved one. Hang out with your friends. Watch an event at the Dome. Or simply admire the surroundings. Overall, the Sky Garden is one beautiful sight. I'm thrilled with SM City North EDSA's newest addition. A city never stops evolving and the Sky Garden is a perfect addition for people in a busy city. After all, what would a city be without a garden ? Nice tip here. The Sy's are finally catching up with the Ayala's in coming up with more "green" structures which serves as oases in the heart of concrete jungles like Manila and QC.